Working in the lab can be a great way for students to gain in-depth knowledge of science topics and apply concepts while working cooperatively. Staying safe in the lab means knowing what dangers your students may encounter, as well as how to avoid them! It's all fun and games until someone ignores the Bunsen burner! When dealing with hot surfaces, practice and review the procedures to minimize fires. 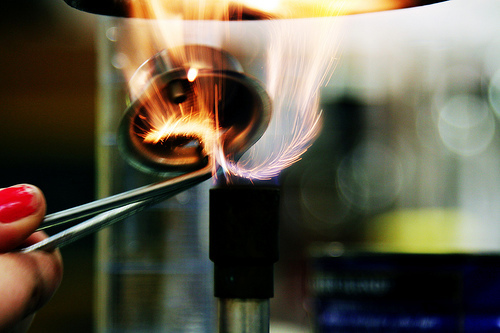 Make sure all flammable materials in the lab are properly sealed and stored, and be sure to train students to inspect burners for any leaks to prevent sudden flares. Handling hot items hastily without the proper tools can result in serious burns. Teach students how to properly use tongs, water baths, and other cooling equipment, and stress the importance of never touching hot surfaces with a bare hand. Protective gloves are essential when handling chemicals. Instruct students on the importance of treating chemicals with respect and caution, and advise them to measure carefully and use only approved containers for transferring and containing potentially irritating chemicals. When using sharp tools for dissection, students should receive instruction in how to safely handle blades. In addition, when disposing of sharp items, like broken glass, needles, or razor blades used for cutting lab materials, be sure that students know to carefully wrap these items before carrying to the trash. "Wash your hands" may seem like basic advice, but it's important that all students in the lab follow careful handwashing procedures. Before and after interacting with any foreign substances, students should thoroughly wash their hands, and also protect their clothing and skin with lab aprons, gloves, and/or glasses as needed. Leaving the lab with bacteria, tissue, or other potentially harmful substances on their skin or clothes can result in contamination of desks or lunch tables, causing illness and other complications. Accidentally inhaling gases in a poorly ventilated space can cause headaches, nausea, and even fainting. Be sure to teach students the proper procedures for opening windows, using ventilation fans, and using equipment to measure the amount of gas emission in a room to ensure safety. Spilling liquids and dropping glass beakers is typically the result of not following procedures and rushing. Emphasize the importance of carefully moving through each step of the lab to avoid any hasty movements. Let students know about the potential dangers that can come from spilling chemicals and breaking glass in the lab, and teach clear clean-up policies in the event that a spill or break occurs. Spending time on safety rules is a hallmark of a successful science classroom. By not skimping on your safety talk, you'll end up with more time to experiment and learn without the drama of a dangerous accident! Disclaimer: Check your state and local codes for further guidance on the safe storage, handling, and disposal of STEM materials. In the case of exposure to hazards and injury always seek the support of qualified medical personnel.